Raksha Bandhan (the bond of protection in Hindi) is a Hindu festival, which celebrates the relationship between brothers and sisters. It is celebrated on the full moon of the month of Shraavana. The festival is marked by the tying of a rakhi, or holy thread by the sister on the wrist of her brother. The elder brother in return offers a gift to his sister and vows to look after her same while an elder sister returns offers to her younger brother. The brother and sister traditionally feed each other sweets. It is not necessary that the rakhi can be given only to a brother by birth; any male can be "adopted" as a brother by tying a rakhi on the person, that is "blood brothers and sisters", whether they are cousins or a good friend. According to ancient traditions, it is customary to have protection threads that are charged with sacred verses (Mantras) and sanctified with rice, durva grass etc. ; to have these tied by people who know the Vedas or by near and dear ones. This protection thread saves from sins on the one hand and removes diseases on the other hand. By tying this thread, protection is afforded for a full one year and all kinds of fears are removed. Nowadays Rakhis are decorated with soft silky threads of various colours, and also with ornaments, pictures, gold and silver threads etc. These Rakhis enhance the artistry of the people. Within these Rakhis reside sacred feelings and well wishes. It is also a great sacred verse of unity. Acting as a symbol of life's advancement and a leading messenger of togetherness. The origin of this festival is usually traced back to the historical incidents of Indra's fight with Vritra-Indra that resulted in Indra's loss. Then, his wife had tied a thread around his wrist and empowered it with divine powers to make sure Indra emerged victorious in the duel that followed. 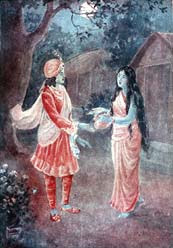 Krishna and Draupadi Another incident is the one that concerns Krishna and Draupadi, the wife of the Pandavas. She had torn a strip of silk off her sari and tied it around Krishna's wrist to stop the flow of blood Krishna was so touched by her action that he found himself bound to her by love. He promised to repay the debt and then spent the next 25 years doing just that. Draupadi in spite of being married to 5 great warriors and being a daughter of a powerful monarch only trusted and depended wholly on Krishna. Krishna repaid the debt of love during Vastra haran of Draupadi. Draupadi's Vastra Haran was done in the assembly of King Dritrashtra,when Yudishter her husband lost her in gamble. At that time Krishna gave her saree (extender her saree) to save her.This is how He paid his debt towards rakhi tied to him by Draupadi. According to another legend the Demon King Bali was a great devotee of Lord Vishnu. Lord Vishnu had taken up the task to guard his kingdom leaving his own abode in Vaikunth. Goddess Lakshmi wished to be with her lord back in her abode. She went to Bali disguised as a Brahmin woman to seek refuge till her husband came back. During the Shravan Purnima celebrations, Lakshmi tied the sacred thread to the King. Upon being asked she revealed who she was and why she was there. The king was touched by her goodwill for his family and her purpose and requested the Lord to accompany her. He sacrificed all he had for the Lord and his devoted wife. Thus the festival is also called Baleva that is Bali Raja's devotion to the Lord. It is said that since then it has been a tradition to invite sisters in Shravan Purnima for the thread tying ceremony or the Raksha Bandhan. According to another legend, Raksha Bandhan was a ritual followed by Lord Yama (the Lord of Death) and his sister Yamuna. Yamuna tied rakhi to Yama and bestowed immortality. Yama was so moved by the serenity of the occasion that he declared that whoever gets a rakhi tied from his sister and promised her protection will become immortal. The story of Rani Karnavati and Emperor Humayun is the most significant evidence in the history. During the medieval era, Rajputs were fighting Muslim invasions. Rakhi at that time meant a spiritual binding and protection of sisters was foremost. When Rani Karnawati the widowed queen of the king of Chittor realised that she could in no way defend the invasion of the Sultan of Gujarat, Bahadur Shah, she sent a rakhi to Emperor Humayun. The Emperor touched by the gesture started off with his troops without wasting any time. The oldest reference to the festival of rakhi goes back to 300 B.C. at the time when Alexander invaded India. It is said that the great conqueror, King Alexander of Macedonia was shaken by the fury of the Indian king Puru in his first attempt. Upset by this, Alexander's wife, who had heard of the Rakhi festival, approached King Puru. King Puru accepted her as his sister and when the opportunity came during the war, he refrained from Alexander. On the day of Rakhi, sisters prepares the pooja thali with diya, roli, chawal, rakhi thread and sweets. The ritual begins with a prayer in front of God, then the sister ties Rakhi to her brother and wishes for his happiness and well-being. In turn, the brother acknowledge the love with a promise to stand by his sister through all the good and bad times. Sisters tie Rakhi on the wrist of their brothers amid chanting of mantras, put roli and rice on his forehead and pray for his well-being. She bestows him with gifts and blessings. In turn, brothers also wish her a good life and pledges to take care of her. He gives her a return gift. The gift symbolizes the physical acceptance of her love, reminder of their togetherness and his pledge. The legends and the reference in history repeated, the significance of the festival is emphasized. Almost all the festivals celebrated in India act as a unifying factor in bringing together people of India. Raksha Bandhan or Rakhi is no exception as this beautiful festival of India also binds people together in a display of . Raksha Bandhan celebrates a very precious relationship shared between a brother and a sister. The day of Raksha Bandhan has over a period of time gained tremendous importance in India. Rakhi signifies a bond of love and care between a brother and his sister and contributes towards the social harmony of India. One can clearly witness celebrations and involvement in the festival of Rakhi by people cutting across man-made barriers like religion, caste, color, etc. and reaching out to each other. This display of oneness is what makes Raksha Bandhan a special and important festivals of India. If the sister bears any expectation of a gift from the brother then she is deprived of spiritual benefit. When she does not have any expectations, she benefits from the blessing of the brother. Thus she benefits at a spiritual level. How should the spiritual emotion of the sister be while tying a rakhi? Srikrushna's finger was cut and blood was oozing out of it. He went to Draupadi. Without much thought she tore a piece of the pallu of the expensive zari saree she was wearing and tied it to His finger. On Raksha Bandhan day every sister should have the spiritual emotion like Draupadi. Hidden beneath the traditional tying of the knot of protection is a deep and relevant meaning that is carried on from ancient times in India. In addition to conveying the love a sister has for her brother and vice versa, the occasion spreads the message of harmonious family ties. At the same time, all responsible individuals should strive to nurture brotherly and sisterly feelings towards each other and live in harmonious coexistence with each other. Even though one may not be related as brothers and sisters by blood, people should develop the strength to respect each other by nurturing noble thoughts towards each other. Therefore, members of the extended family, cousins, friends and individuals with brotherly feelings also heartily participate on this occasion. » Rakhi in India (West): Nariyal (Coconut) Purnima is celebrated in the west on the day of Raksha Bandhan. Coconuts are thrown in to the sea as a mark of respect and offering to Lord Varuna. 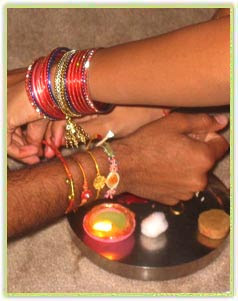 » Rakhi in India (South): In the southern part of India the day of Raksha Bandhan is celebrated as Avani Avittam. This day is auspicious especially for the Brahmin community as they change their religious symbol of janeyu (holy thread) amidst chanting of mantras. » Rakhi in India (North): Rakhi Purnima also called Kajri Navami and Kajri Purnima is a celebration in North India when wheat is sown. Goddess Bhagwati is worshiped and the farmers seek her blessings for a good crop. » Rakhi in India (East): Rakhi ceremony was initiated long back in 1905 by Rabindranath Tagore in Shanti Niketan and the custom is still followed religiously by the students of Shanti Niketan. Kajari Purnima Falls on the same day as Raksha Bandhan that is on the Shravan Purnima. This festival is mainly celebrated in the Central India that includes Madhya Pradesh, Chattisgarh and part of Uttar Pradesh. Since this festival falls at the end of the monsoon season, it is of great importance to the farmers. On the ninth day after Shravana Amavasya, the preparations of the kajari festival start. This ninth day is called Kajari Navami. The rituals are performed by the ladies blessed with a son. The rituals continye till the Kajri Purnima or the full moon day. On the Shravan Shukla Navami, women go to fields and bring earth in the leaf cups. Leaf or barley is sown in it and kept in a dark room where no sunlight or fresh air reaches. The place where this leaf cup is kept and the surrounding walls are cleaned and washed with mud and cow dung. The place then is decorated patterns made by rice solution.The motifs are generally the house hold articles and activities. Figures of a house, a child in cradle, a mongoose and a woman with a pitcher are mandatory figures. This art of drawing with the rice solution on mud washed floor is called Navami. And then the cup is worshiped. The worship is repeated fot seven days till the full moon day. The evening of the full moon day has the final ritual. The women move out in procession carrying the leaf cups on their heads. They carry it to a pond or any other water body and immerse it. Women keep fast on this day and pray for the well being of their sons. The festival is of importance to the farmers as it signifies the beginning of the sowing season for wheat and barley. They worship Godess Bagwati and seek blessings for a good crop. This festival is important for those who depend on sea for their life.On this day the Sea God, Varun is worshiped.The coconuts are offered to the Sea God thus the name Narial purnima or the coconut full moon. It is the time of retreating monsoon. The skies are clearing, the tides are receding, the sea is less violent. It is the festival time for the people of the coastal areas. The people offer coconut to Lord Varun to invoke blessings and offer thanks giving. For the fishermen is is the beginning of the new fishing season. During the monsoon the seas are more violent. The fishermen don't wade into seas during this time. Shravan Purnima signifies the end of Monsoon. The Fishermen decorate their boats, paint it new and put flags. They then carry decorated coconuts to the sea. It is kind of a community gathering there. They celebrate together, sing and dance together. In the end they worship the Sea God and offer coconut. The decorated coconuts are thrown in the water with prayers of a plentiful fish catch. A coconut has three eyes. It is said to represent Lord Shiva, the three eyed God. Coconut is considered to be an auspicious offering to Gods. A coconut is broken in front of the deities before taking up a new venture to seek blessings and on successful comlition for thanks giving. Coconut is important for all religious occasions. Thus coconut is considered to be an ideal offering to the Sea God as well. Pieces of coconut and coconut are distributed as 'prasad'. Coconut rice is the main dish on this day. Pavitropana is a festival of Gujaratis. It is celebrated on the very same day of Rakhi Purnima and falls in the month of Shravana. According to the legends, Gujaratis are the staunch believers of religion and generally they worship lord Shiva. On this auspicious day, most of the people offer water to the Shivalingas in the nearby temples, offer prayers to Lord Shiva and seek his blessings. It is believed that whoever, prays on this auspicious day, all his past sins are forgiven. This festival has also been referred to as Putrada Ekadashi in Bhavishya Purana. In this Purana, Lord Krishna has narrated the story of how the Ekadashi in the month of Shravana came to be sacred. He states,“At the dawn of Dvarpara-yuga there lived a king by the name of Mahijita, who ruled the kingdom of Mahismati-puri. Since he had no son, his entire kingdom seemed utterly cheerless to him. “A married man who has no son gains no happiness in this life or the next.” The King tried hard to beget children and continue his lineage. But it seemed that lady luck had turned against the king. As years progressed, he became anxious and called for an assembly of advisors. He told that he had never committed any sin or did anything wrong to anyone. Yet the Gods have not blessed him and the kingdom with a son. He asked everyone to find out the reason for this. The Ceremony of Pavitropana involves Pavitras, a few filaments of cotton and sometimes kasa grass which are closely entwined, knotted together and soaked in a mixture of Panchgaivya (cow's ghee, milk, curd, urine and excreta). Pavitropana or the Shravana Purnima is considered as an auspicious day for the final poojan of the three eyed God. In the Pavitropana ceremony, a few twisted filaments of cotton are soaked in panchagaivya (mixture of cow's ghee, milk, curd, urine and excreta) and then fastened around the Shivalinga. Panchagaivya or the five products obtained from cow which is the most sacred animal according to the Hindu mythology. Avani Avittam or Upakramam or Avani Attam is a ritual followed by the Brahmins who read Yajurveda. It is most commonly celebrated in southern states of Tamil Nadu and Kerela, and states of Orissa and Maharashtra. It falls on the Shravan Purnima that is the same day as Raksha Bandhan. On this day, a Mahasankalpam or a vow is taken for atonement of all our sins in the past year. The Brahmins take a holy dip and wear a new holy thread called Yajnopavit or Janeyu. The first step is a 'prayashchita', A prayer to atone the sins. It says, "For the removal of all my sins and thereby to secure a divine blessing and for qualifing myself to perform the essential duties of Brahmanas as prescribed in the vedas and smritis and adopted by the really good in their conduct I put on this Yagnopavita". When the thread is worn another mantra is recited which means -"I put on the sacred thread which is highly pure, is inseparable from God, is capable of prolonging life and is the foremost in the accomplishment of a Brahmana. May such pure Yagnopavita bring strength and dignity. While removing the old thread, the mantra means -"I throw away the broken dirty old thread, may the new one bring on long life and Brahmana's brilliance. Upakramam means the beginning. On this day the Yajurvedis begin to read Yajur Veda for next six months. The day is auspicious because as per Indian mythology Lord Vishnu was incarnated as Lord Hayagriva,the lord of knowledge, the one who restored the Vedas to Brahma. Imp : Upakarma should not be performed with wet cloths. If it is done , it is termed as Rakshasa. During Upakarma, a new sacred thread should be worn, That is Upakarma should be done with new cloths and new sacred thread by every one and in case of Brahmachari they should wear in addition a new belt, new deer’s skin and new staff. Good comments. A brother is a friend given by Nature and a sister is like the sweet chocolate chips in the cookies of life. The bond of this relationship is that they share the greatest memories of childhood. Raksha Bandhan is a day to celebrate this eternal bonding of brother-sister relationship. A tradition ceremony of tying a Rakhi thread on the right wrist of a brother by a sister is to make stronger this flawless bond of love and care has been followed from a long time in India. This holy thread of love is known as 'rakhi'. And this festival is known as Raksha Bandhan. Very informative blog. !! Thanks for sharing it with all of us. :) Happy Rakshabandhan in advance. Explore our outstanding Rakhi site where huge collection of remarkable Rakhi and Gifts available to send anywhere in India without any shipping charges. Send Rakhi India - Free Shipping endeavor genuine and trusted Rakhi and Gifts delivery services at any location in India for your loving family on this auspicious festival of Raksha Bandhan. Nowadays in this busy lifestyle it has become a very tough task to go the market and select rakhi for your brothers, bhabhi and sisters. Just to provide an easy way to choose and send rakhi online to your loved ones we suggest you a much easier way by which you can Send Rakhi. Raksha bandhan is a special occasion for every brother and sister and I feel it is should be celebrated even when they are away from each other. Hence we have a great option where we can send rakhi to india online and celebrate the festival. I am really impressed by see your article It Is So Interesting post What a fabulous blog,Really it will help lot of people . I am very happy to read your article thanks for sharing with us. On a full moon day in the month of Sravana (August), sisters tie thread amulets on their brothers’ wrists. send rakhi to India online with Indian rakhi store, India-gift.in. Running away from girls on Raksha Bandhan? Read this article by The Logical Indian Christian.